Many years ago I got tired of watching my athletes roll in to the athletic training room and slap on ice. These athletes are in a drug-like induced state of ice addiction. Their athletic trainers keep feeding the disease, by recommending cold treatment and doing the easy – here’s ice, shut-up, leave. I felt I was doing a disservice to my athletes and asked myself, “Why are we icing this injury?” I never had an answer that was supported by evidence. So I began my own case study. I took 9 Division I athletes (6 patellar tendinopathy, 2 bicipital tendinopathy and 1 subacromial impingement) and had the athletes cease all cryotherapy and electrical stimulation. Warning: Telling an athlete not to ice brings about a firestorm from all angles. Coaches, parents, the athletic director, the family friend chiropractor, the great aunt who is a dentist, and even mom the real estate agent will question your motives. It is possible you will be hung, drawn, quartered, and undoubtedly face major scrutiny. Your athletes will whine, piss, and moan the day you stop allowing ice. Your athletes may befriend a student athletic trainer to do the dirty deeds. You must have the scientific facts to fight all naysayers. I then put the athletes on a rehabilitation only protocol. My results, all 6 patellar tendinopathy issues resolved. 1 biceps tendon resolved, the other was later found to have a SLAP tear. The subacromial had no change. Why did this work? Because I followed the science, used common sense, and challenged traditional thought. The NATA and the BOC have emphasized the importance of Evidence Based Practice. As clinicians we will have better outcomes if we listen to the evidence. During the NATA conference I was glad to see lectures supporting my thoughts and the evidence. I tweeted my thoughts and had an immediate response of “what?” “Really?” “Why?” There is lack of evidence to support utility of cold for healing. Inflammation is the initiation of healing, so why do we stop the healing process? Inflammation occurs within seconds after injury. Why allow inflammation to start then stop the process? Imagine cars on a busy freeway as cells moving to a location. Then, suddenly a roadblock is applied and only some of the cells make it to the site. How are you supposed to heal and repair if the body is not allowed to do its job? Let’s use the analogy of baking a cake. You go to the store, buy ingredients, come home mix all the ingredients, but I won’t let you bake the cake. Now you have a bunch of material that you created, that is now wasted and no longer useful. Doesn’t make sense does it? It is true we want to limit excessive inflammation and we want to facilitate removal of inflammatory byproducts from the injury site. However, ice / cold does not do this. Ice prevents movement and removal. In the case to limit excessive inflammation and remove inflammatory byproducts, use compression, elevation, and massage, not ice. We often sue the term “tendonitis”. However, the “itis” is not really true. Tendon is not really inflamed, rather it is deranged (Tendiopathic / tendinopathy). When tendon is deranged you should apply the theories of mechanobiology, cellular signaling, and mechanotransduction to repair tissue. If you want more info on mechanotransduction, I have written a blog dedicated just to that. Evidence has shown that tissue loading through exercise or other mechanical means stimulates gene transcription, proteogenesis, and formation of type I collagen fibers (See studies by Karim Khan, Durieux, Mick Joseph, and Craig Denegar). Ice does nothing to facilitate collagen formation. Tenocytes are spread out and have octopus like tentacles that connect cells and fascia. When a load is applied to a tenocycte the force is transmitted to neighboring cells. 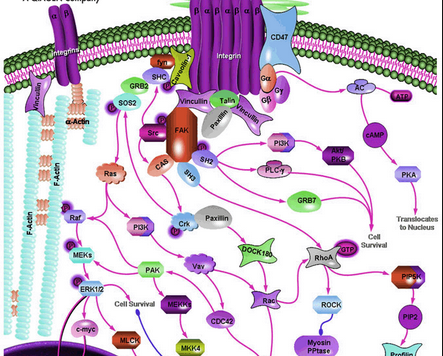 The neighboring cells receive the signal through receptors called integrins. The integrins then carry the signal from the outside of the cell to the inside. This signal is then carried down actin filaments to the cell nucleus, where transformation occurs. See the image to right for a visual. Our body has all types of cells (osteo, white, red, fibro, etc.). Stem cells are cells that have no idea what they will be in the future. Then there are proginetor cells. These cells have some idea what they will be, but can still be manipulated and changed to a specific cell type. So a progenitor cell can become an osteocycte, chondrocycte, tenocyte, etc. Load in tendon tells our body to turn a progenitor cell in to a tenocyte. Load in bone tells a progenitor cell to become an osteocyte. Why do bone stimulators work? Because we are loading bone by using sound waves to apply a mechanical force on bone. Similarly, tendon is thicker and more dense in athletes, because they load tendon more. The acronym RICE is bogus in my opinion. Rest is not the answer. Rest does not stimulate tissue repair. In fact rest causes tendon to waste. You may say, “yeah but this is an overuse injury, you must rest.” True, overload does cause tendon thickening and tendon stiffness, but rest is not the answer. Appropriate load IS the answer as it stimulates metabolic processes of repair. The other reason RICE is bogus is obvious, as the blog title indicates, ice. Evidence shows that cryotherapy slows metabolic processes and nerve conduction velocity. Metabolic pathways are necessary for human function. Cells are supposed to produce catabolic and anabolic reactions. This is a constant process in all humans. During healing we breakdown and rebuild tissue. Cold inhibits this function, so in a sense we are slowing the necessary catabolic and anabolic pathways. I heard a great discussion at the NATA conference discussing ice and stim. Ice is designed to reduce pain by decreasing nociceptor fiber response and slow nerve conduction velocity. Stim (IFC / Premod / Biphasic waves) is designed to pump impulses at a high frequency to stimulate large diameter nerve fibers and override pain fibers. But if Ice slows nerve velocity, then why do we combine cold with high frequency stim? Is this not counterproductive? What happened to good ole rehab? Why use modalities and rest when you can rehabilitate. And don’t use the argument for a time crunch as I already wrote a blog on creating a beneficial rehabilitation program in 15 minutes. It just makes no sense. The NATA and BOC are emphasizing clinicians use evidence base practice. If you are a clinician, use the evidence and steer away from traditional thought if it does not work. Thanks jay. Means a lot. so, what is your opinion on shockwave therapy along with prp? how can i get rid of that bone inflamation that stems from this “jumper’s knee”? do i really need to do that first before i start rehab? Thank you for the question. If you wish to contact me for online training please send an email to JoshStoneATC@gmail.com. While shockwave treatment is commonly prescribed it does not have a lot of support in literature. I just don’t see the huge benefit. PRP on the other hand does have better results in studies. However in my Clinical experience I have not seen great success. The best evidence is the use of eccentric strengthening protocol to help repair tendinopathy. The positive outcomes is really high. Personally, this has been my greatest mode of treatment as well. Perform a Google search for eccentric exercise program for patellar tendinopathy. You’ll get a lot of Good things to read. As an ATC with my MS in Kinesiology and published work, I find your study lacking in many areas. I am professor of A & P and I find your knowledge in modalities frigthening. I suggest going back and taking physiology again and some possible kinesiology and modalities courses. Ice and heat has never been the only treatment we as ATCs offer. Now if that is what you were taught you should have choosen a better program. My undergrad studies didn’t let us as students graduate with any of those questions, we knew why we do what we do on a physiological level. However I do agree that some ATCs have become lazy in their rehab mainly because they are probably hired by a clinic which then they are told to do minimal rehab and refer. Your case study needs a lot of work and the entire vilidity is weak. You cannot test athletes that have chronic issues against ice. The main indication of using ice is on acute injuries and if you didn’t know why upon graduating than you shouldn’t practice until you do. The concept of RICE seems to be lost with you and most ATCs. For most chronic injuries esp. in the younger population rest is indicated because of all year round sports, a body needs to have a reset period! After an acute injury their needs a rest period before you can begin rehab. Ice is the pain relief that isn’t pill form which is good considering how many athletes get addicted (ice won’t kill you!) And while they are icing that is rhe rest! These are basic physiologic principals. Good luck with your athletes but I will be using ice still appropriately in combination with rehab. For acute and some chronic injuries if warnented. Thank you for the feedback. First and foremost – this is a blog site –ergo an opinion that has been built upon my readings. Let me address your concerns. First, your words: “I find your study lacking in many areas… Your case study needs a lot of work and the entire vilidity is weak. You cannot test athletes that have chronic issues against ice.” As a professor who has published work (which I would love for you to share), you should understand what a case study is. A case study is a simple analysis of a person, or group. I did not perform a randomized control trial. I did not compare against a control. I am not setting P-Value to determine statistical significance. Therefore your statement of weak validity is not relevant. I was not seeking validity, reliability, or specificity / sensitivity. It is simply a case study – an experiment of my own clients in an uncontrolled setting. You find my knowledge of modalities and physiology frightening. Would you please share with me the statements I made that were inaccurate and frightening? I never said “Ice and heat has never been the only treatment we as ATCs offer.” I said, ice and modalities are overused, specifically on chronic injuries. I agree on ice with acute injury, but if you think Athletic Trainers do not ice chronic injuries then please observe any traditional athletic training facility at the end of practice. You will a majority of the athletes getting iced have chronic injuries. I agree, rest is important; we do need to cut back on year round training. That said, rest is also deleterious and does not stimulate repair. Rest alone does not heal, rest simply removes exacerbating activity. I do not disagree with you here: “After an acute injury their needs a rest period before you can begin rehab. Ice is the pain relief that isn’t pill form which is good considering how many athletes get addicted (ice won’t kill you!)”. Ironically, athletes are addicted to ice. I also agree with your final statement, ” I will be using ice still appropriately in combination with rehab.” I find this great, as this is the entire point of this blog. Josh, first of all thank you for this site in general, and this article in particular. I remember when you visited our grad class at SJSU. You impressed me as being extremely knowledgeable regarding sports medicine, especially in the areas of cell biology and pathophysiology. This site only confirms those impressions. As for this article, you certainly raise many salient points regarding cryotherapy. As healthcare professionals, we should always be examining WHY we administer any treatment or modality. I know that I often get into ruts where I become very cookie-cutter in my protocols, so I appreciate a dissenting thought to shake me up a little. However, I also feel that a professional with your level of skill and intelligence should not have to resort to calling out a commenter for typos. That is a lazy way to debate someone online, especially from someone living in the glass house built with “image cars”, “derranged”, and “heard a great discussing”. Again, I think you raise very intriguing and somewhat controversial points, and will continue to follow your blog. I only ask that you respond to criticisms in the comments with the same logic you use in your posts. I agree 100% with your comments and you are right, I should not go to that level regardless of the comment. Re: my typos – I have attempted to edit these typos (and others) several times. Some changes stick, some don’t. I have even contacted wordpress tech for assitance – apparently it is being resolved. I need to do a better job proof reading on the front end and I should create the docs in MS word rather than WP editor. No I have not seen this but I have mad respect for Kelley and mobilityWOD. He is super smart so I am glad my thoughts align with his. Josh, I can’t agree more. I have been fighting this battle with colleagues and athletes alike for quite a while. Do you have an email address? I’ve got an article that I wrote a couple of years ago that gives a discussion along these lines but with recovery for baseball pitchers. Think it might be an interesting read. I remember having you as one of my college professors and LOVED it ! This article was very interesting it also brought up a few great thoughts as I was reading to! I have had injuries such as with my knee in past years and it was frustrating when people would tell me to use ice and I was like guys really it doesn’t help it makes it feel worse. I was wondering if there was any more detail to back this thought up of mine? I really enjoy reading your blog posts on here and can’t wait to read the next one to come. You always have such GREAT articles to read. I agree with you on this post, Josh. This is definitely an uphill battle too but one that is needed. Keep up the good work Josh. What do you think about pitchers icing following an outing? Or the basketball player icing their knees in the fourth quarter / post game? We seem to see this on TV all the time. What would you say to a class of students who offer this opposition? If a student offers that opposition I would ask that person three questions. 1 – Why are you applying ice? 2 – Have you tried not icing and just rehab? 3 – Is the athlete improving by doing what you are doing? If they provide a good evidenced based rationale as to why they prefer to apply ice on that athlete and can say they have tried rehabiltiation without icing then I say go for it. All I ask the student is to think about it and try something outside the box. During Pain Awareness Week it is key to know what things might not be working to reduce pain. Many people think that ice heals all but what does it really do? Read this article for some insight into the most overused modality! Excuse me, when conducting sport competition, if the athlete suddenly has acute ankle sprain, but he must continue the competition, is it appropriate to use cold spray? or what can i do? Josh, what are your thoughts on ice baths and cryotherapy to speed recovery between sessions? Is the US Government Responsible for the American Obesity and Chronic Disease Epidemic?